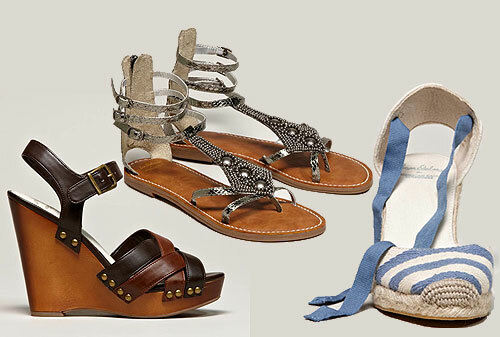 Sam Edelman For American Eagle Has Us Yearning For Sandal Season! No matter how cold it still may be in these mid-winter weeks, the countless spring collections cropping up left and right are almost tempting enough to make us consider risking our health by wearing the fierce spring fashions while it’s still freezing out. Floral tanks, printed shorts, swingy skirts, sundresses and more have me beelining straight to my wallet… though luckily, so far I’ve had the strength to resist when it comes to apparel. Spring shoes, however, are a different story! Now that Sam Edelman’s collection for American Eagle has hit stores and online, I’m pretty sure my days of self-restraint are numbered. With plenty of sky-high wedges, chic clog-inspired sandals, fanciful flats, glorious beaded gladiators, and drool-worthy espadrilles, the designer’s irresistibly affordable collection for the brand boasts the perfect mix of comfortable classics and fashion-forward trends. In other words, there’s not only something for everyone – there are multiple pairs that just about every shoe-lover will have an extremely difficult time saying no to!